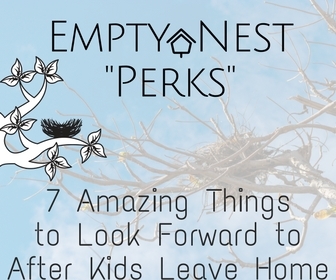 What I discovered after the last of my eight kids left home, is that most moms are not as prepared for the wave of emotional contemplation that takes place after “empty nest life” sets in. There you are….standing in the driveway, watching your last child drive away from home for the last time as you come to terms with the fact that you are now the mom of an adult child and your parenting job is done. Over and out. “How in the world did I get here so fast? Did I do enough? Will they be okay? My life will never be the same. Do I even know who I am apart from my role as my child/rens mother? And the big one…. It’s an experience that seems so surreal when it happens. I’ve been a full-blown empty nester for over a year and a half now, and I can tell you I was a pathetic mess when I waved my youngest off that chilly December day. I have felt the waves of emotions crash over me too, mama friend! But I’m here to let you know I survived the trauma, and you will/can too! Feel free to print, post, and share this download as you please. Click the button below to get your free download now.